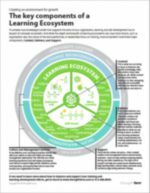 Watch: Exploring the learning ecosystem - ThoughtForm, Inc.
Nancy Herzing: When you boil it down it’s really three major parts. I’d say the first major part is what everyone thinks about: content. What knowledge you’re trying to impart on your team, what skills you want them to gain. That can be anything from something pretty technical like software interface, or something more like soft skills—customer service, language, or best practices. It could even be broad techniques such as consultative sales and how to go about that, or how your organization goes about that. But really that’s the content, what knowledge you want to impart on people. And there are best ways to share that content, we don’t have time to go into that today, but is it dialogue, or trial experience, there’s lots of ways to share that content. I like to think about content as the “What.” What you are trying to share. I’d say the next thing is delivery. You know you are taking that content and packaging it up in some ways. That delivery could be done anywhere from eLearning to webinars to tracks of experiences, multiple experiences, even mentoring. There are lots of ways to deliver the knowledge and you need to align it with your content to have it make sense. So I like to think of that as the “How” or even the “When.” Sometimes you need to trigger how you deliver your content when you’ve completed something, or just finished some sort of project and it’s timely. So that can be some part of delivery as well. So, I think the key thing there is not to create a training program. It’s about creating training experiences. Whether that is technically a program or an eLearning course, or a one-off seminar or training that you are doing, think about them as experiences. Just that shift in thinking about it as a thing you are doing to impart knowledge, to a hosted, well-thought-out event. That can shift how you think and change it from being something that you want to go to, versus just a check-the-box sort of thing. By that shift, you’ll start to consider things that make the experience: how do you make the user feel hosted, make them feel important, and that you really care about them learning this knowledge. How do you make the content feel very relevant to what they are doing versus another role.